BUDAPEST: Lilly King of the United States claimed her second world record this week in winning the women’s 50m breaststroke gold at the world championships yesterday. King clocked 29.40 seconds, breaking Ruta Meilutyte’s four-year-old record of 29.48, with Russia’s Yuliya Efimova taking silver at 0.17 back and America’s Katie Meili earning bronze at 0.59. This was the second world record the 20-year-old King has broken in Budapest after also lowering Meilutyte’s time for the 100m breaststroke in winning Tuesday’s final. The victory was King’s second this week over rival Efimova, who took bronze in the 100m final but had beaten the American over 200m with a commanding display on Friday when King finished fourth. The American sparked a war of words at last year’s Rio de Janeiro Olympic games when she branded the Russian a drugs cheat after Efimova’s 16-month ban for doping which ended in February 2015. 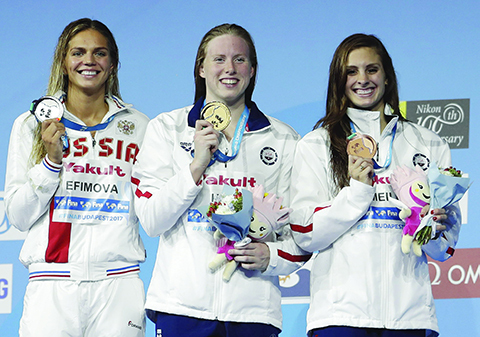 Meili paid tribute to her American team-mate. “I’m satisfied, that’s my first time under 30 seconds,” said the 26-year-old, who also took breaststroke silver over 100m. going into the fourth round, but the British diver over-rotated his entry as he attempted a three somersaults forward with 4-1/2 twists effort. He picked up only 70 points and finished fifth. “I definitively felt the pressure. My last dive is relatively new for me, and after four competitions in four weeks, I felt my legs shaking a bit. I had enough power on top of the board, but I had to fight with the G-force in my legs,” Hunt said.